University of Westminster: warm air dryers are not only likely to dry hands but also to increase the amount of bacteria on hands! Warm air dryers cause an average increase in the number of bacteria on people's hands by 254 percent as well as potential contamination of the washroom environment. This was demonstrated in a recent study from the University of Westminster, London, UK. The study also showed that on average, paper towels reduce bacteria on the hands by 77 percent. It is important to maintain good hand hygiene at all times, this is especially true when using a public washroom where there's a risk of contamination from other people. WARM AIR DRYERS ARE PROPER "BACTERIA FARMS"
But it's not always up to the user. The School of Biosciences at the University of Westminster conducted a study of three different types of hand drying solutions: paper towels, regular warm air dryers and the new generation of 'jet' air dryers. Regular warm air dryers performed by far the worst in the tests. 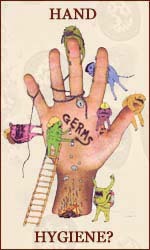 They showed an average bacterial increase by 194 percent on the finger pads and 254 percent on the palms. The results suggest a radical increase in the amount of the Staphylococcus aureus, a type of bacteria known to cause food poisoning, abscesses, boils and potentially penicillin resistant infections. "The presence of any type of Staphylococcus aureus on the hands of a worker in the food industry or medical field should be taken seriously as should any increase in its numbers caused by particular hand drying methods" concludes Keith Redway, a senior academic at the University of Westminster. The study also tested the new type of 'Jet' air dryer. 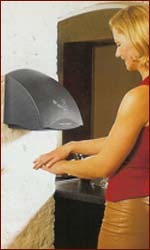 'Jet' air dryers increase bacteria by an average of 42 percent on the finger pads and 15 percent on the palms. Air based dryers do not only cause an increase of bacteria, it can also contaminate the washroom environment and other washroom users. This is caused by the high airspeeds of up to 400 mph (over 600 km/h) that blow out of the unit. Tests showed that bacteria can spread as far as 2 meters from the 'Jet' air dryer. Regular warm air dryers never spread bacteria further than 0.25 meters. "The superior performance of paper towels over the two types of dryer in reducing the numbers of bacteria was shown with both the finger pads and the palms of the subjects" says Keith Redway, a senior academic at the University of Westminster. The test confirmed that paper is the safest method of drying your hands after washing. In all tests, paper showed a reduction of bacteria. The average decrease was 76 percent on the finger pads and 77 percent on the palms. Also, paper is not likely to contaminate the washroom environment or other users. 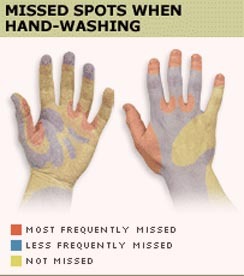 Other research has indicated that certain spots of the hands are often missed during hand washing. The picture on the left presents an overview of those 'missing spots'.